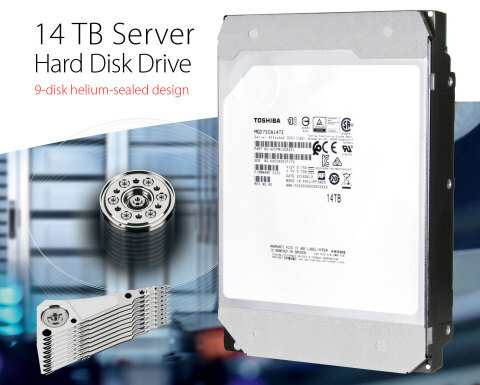 TOKYO--(BUSINESS WIRE)--Toshiba Electronic Devices & Storage Corporation, a committed technology leader, today announced its new Enterprise Capacity 14TB  and 12TB helium-sealed SAS HDD models. The MG07SCA Series features 7,200 rpm performance, a SAS 12Gbit Interface , and Advanced Format Sector Technology. The hard disk drive boasts an industry-leading, 9-disk helium-sealed design and 14TB of Conventional Magnetic Recording (CMR) capacity for optimum compatibility. 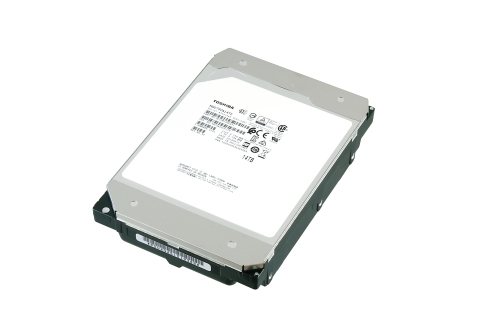 Toshiba’s helium-sealed design fits into industry standard 3.5-inch  drive bays. A 12TB model is also included in the Series offering. The innovative 9-disk helium-sealed design utilizes Toshiba’s precision laser welding process, and a special top-cover design seals helium inside the drive offering high capacity and low power profile to the product. The SAS interface provides 12Gbits transfer rate performance and dual port capability for the data-path redundancy preferred by many storage solutions designers. The 14TB SAS model offers approximately a 40% increase in maximum capacity over Toshiba’s prior MG06 10TB SAS models. Toshiba continues to expand its HDD product offerings with higher storage capacity and performance. The MG07SCA Series further illustrates Toshiba’s capability to advance the design of HDD storage devices for cloud-scale server and storage infrastructure, and to realize more cost-effective data-protection, data-retention, content serving and digital archiving. The 14TB and 12TB helium-sealed SAS HDD models are available for sampling today. Definition of capacity: A terabyte (TB) is 1,000,000,000,000 bytes. A computer operating system, however, reports storage capacity using powers of 2 for the definition of 1TB = 240 = 1,099,511,627,776 bytes and therefore shows less storage capacity. Available storage capacity (including examples of various media files) will vary based on file size, formatting, settings, software and operating system and/or pre-installed software applications, or media content. Actual formatted capacities may vary. Form Factor: "3.5-inch" means the form factor of HDDs. They do not indicate drive's physical size. Power efficiency is calculated based on active idle power consumption divided by formatted capacity. Toshiba's new helium-sealed 14TB HDD models help SAS-based cloud-scale storage platforms achieve TCO(Total Cost of Ownership) objectives.